We are appealing for witnesses after a man was assaulted in Epsom. 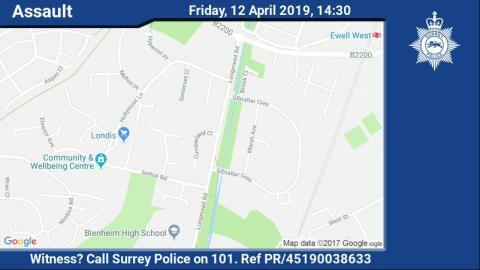 At around 2.30pm on Friday, 12 April the victim was walking along the pavement of Longmead Road towards Chessington Road, when two unknown men on a motorbike mounted the pavement, punched the victim to the back of the head and then drove off. The two male riders had their faces covered at the time and were wearing black helmets with black visors. The motorbike is described as a black Kawasaki or black Hyundai sports bike with a partial registration of HJ13. It is believed that the bike was travelling in the direction of West Ewell. If you were in the area at the time, you might have vital information or dashcam footage which could assist us in our investigation. If you live nearby and have CCTV outside your property, you may have caught something. Please call 101 or tell us more via our website (www.surrey.police.uk) quoting reference number PR/ 45190038633.